Since 1892, The Brown Palace has been setting the standard for style and class around Denver. Not only do people want to stay the night, it is an equally eloquent place to dine. I was reminded of this upon my recent visit. 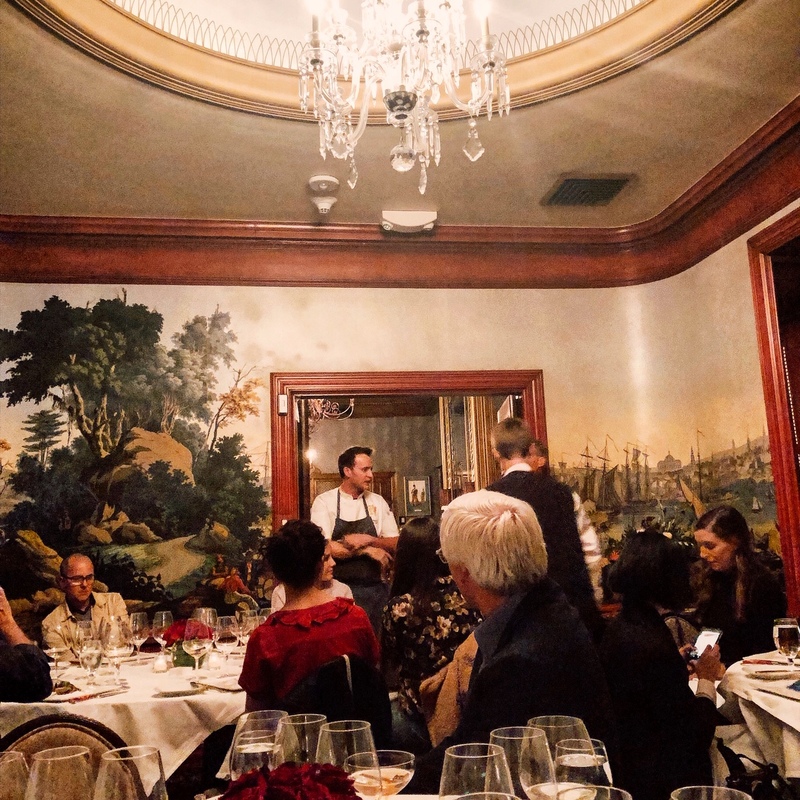 Last week, Palace Arms invited food lovers from around the city to try out the launch of their Fall Harvest Menu. The ambiance matched the event name, and I felt at ease when I entered through the hotel lobby. To your right is the Palace Arms bar, where you can grab a cocktail and have a friendly chat. There were lots of people in there, which gave the room a welcoming hum as we hung left and entered the dimly lit dining room of the restaurant. The walls are adorned with historic novelties, flags and plaques. There are even two pistols in cases hung on the wall, rumored to have belonged to Napolean. Each wall stood tall with intricate detail and lined with darkly stained wood embellishments. Apparently, a former owner/employee of the hotel was collecting parts of old ships and as they began to fill his home, his wife requested that this collection find a new home. All of the old ship pieces came to palace arms and created the ambiance that is so inviting and cozy. As you wind around the dining room even more, there is a separate room called the Independence Room with an equally intriguing atmosphere. There is a long bay of windows that stretch across the left wall of this room. This used to be the entrance to the hotel before it was first built. In fact, this room sits right where someone would have entered off the street. The walls in this small room are illuminated with beautiful scenery. What I later found out was that scenery was really done on hand painted wall paper. Only two other rooms in the world have hand painted wallpaper by the same artist, and they are in The Louvre and The White House. This alone made me want to come back, just to dine in the midst of wallpaper for the elite! Inside the room were 3 large round tables. I sat down and introduced myself to those around me. The room quickly filled with an excited buzz. We sipped on seasonal cocktails and got to know each other until the chef, Garrett Kasper, came out. He talked about his love for food and his vision throughout the meal, presenting each course as it arrived. We started with a beautiful beet salad. 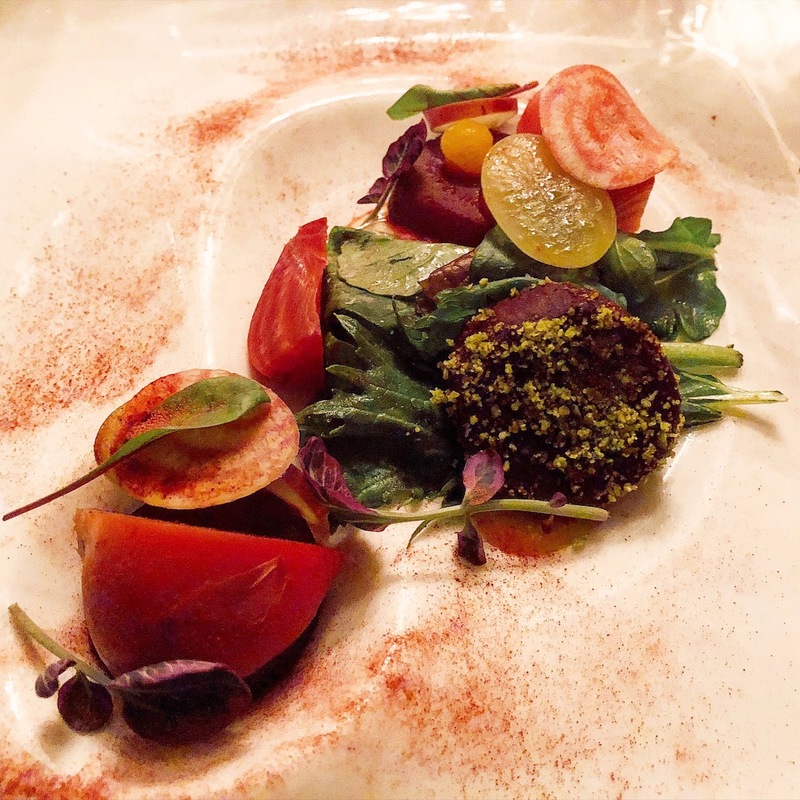 Using beets from Colorado, served three ways, the chef decorated our plates with a multitude of colors. Everything was dressed to perfection, making this my favorite dish of the evening as well as a mighty fine introduction to the meal. Up next was the Moulard Duck. This was super tender and full of flavor from the fat that encased it. It was garnished with beautiful rose colored apples, and berry compote. 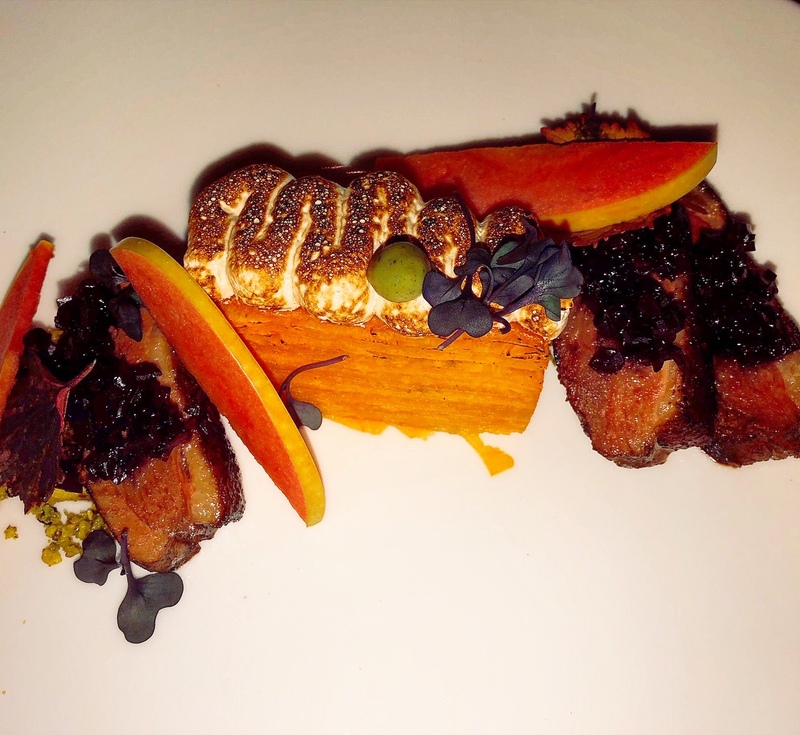 The sweet potato terrine that sat in the center of the plate was truly the star of the show for me. It was perfectly sweet, salty and buttery. My entire thanksgiving will revolve around recreating this heavenly version of sweet potatoes and I will embarrass myself trying! It was divine. Next up was the Elk Loin. 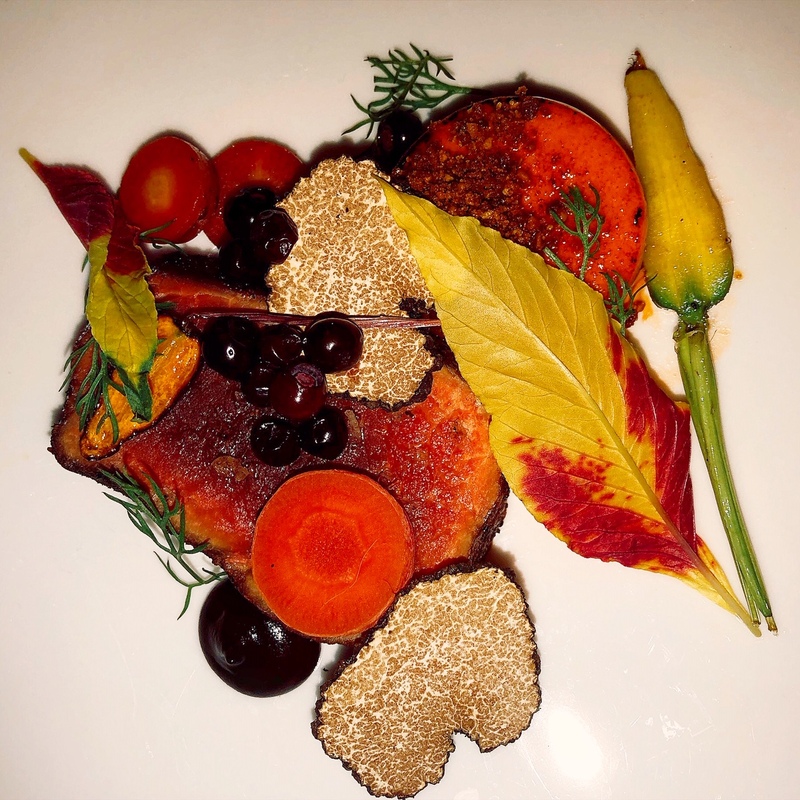 I didn’t want to eat this dish in hopes of preserving its beauty. Alas, I caved and devoured each delicious bite. This dish spoke to the season with its breath-taking garnishes. A true piece of art and honestly, one of the most beautiful plating presentations I have ever seen. Desert was taken literally and showed off the the chef’s skills with a breakdown of pineapple upside down cake. 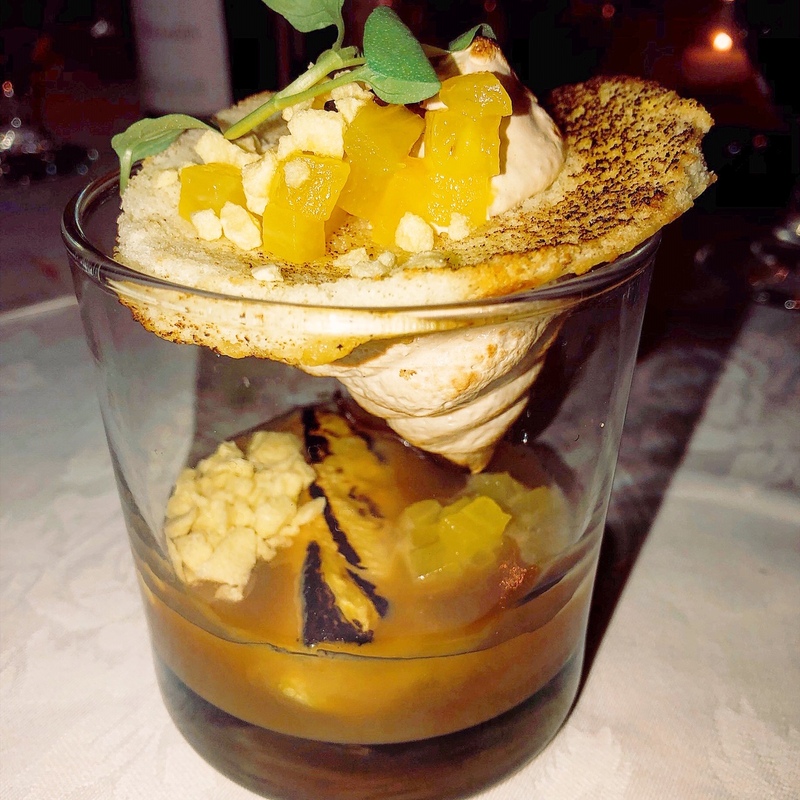 The bottom of the glass that held this next course had a sweet caramel sauce with chopped and roasted pineapple pieces. The glass was then topped with a sponge cake topper with meringue that lead down to the other components. I tossed it all up with my spoon and indulged in the most incredible pineapple upside down cake to date! Oh! How could I forget to tell you. Each dish was paired with a special wine. Starting with white and working into red. Then ending on a sweet note with a little sparkling. I wished I remembered the names but I was too busy enjoying myself. The sommelier did an amazing job pairing for the length of the entire meal. Did I mention there are over 8000 bottles of wine in the basement of Palace Arms, all waiting to be tasted by you? As you can imagine we left feeling full, but did not escape without a sweet treat to take home. 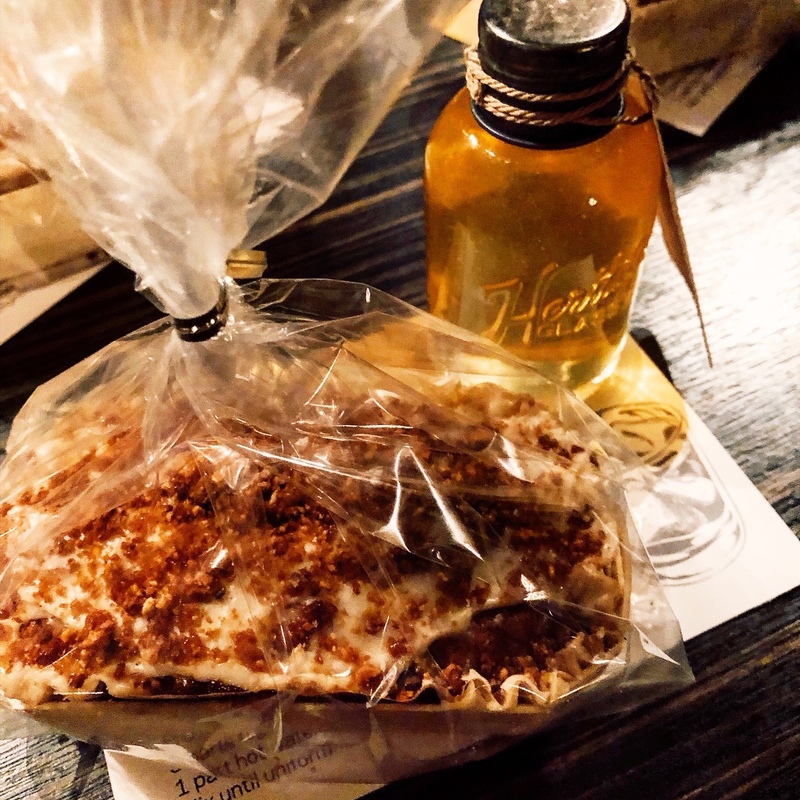 The honey that accompanied this sweet loaf is straight from the rooftop of the Brown Palace. That’s right, the hotel is home to five bee hives where they get honey that is used in spa treatments, seasonal recipes and served with afternoon tea! 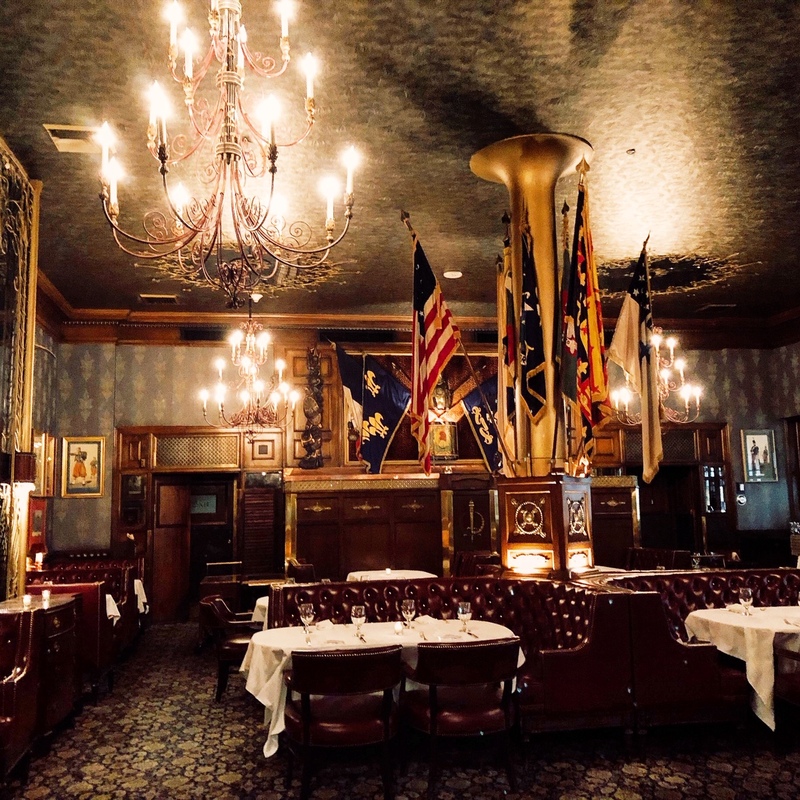 Thank you Palace Arms for hosting me and thank you Brown Palace, for standing as one of Denver’s most classic places to stay and dine.